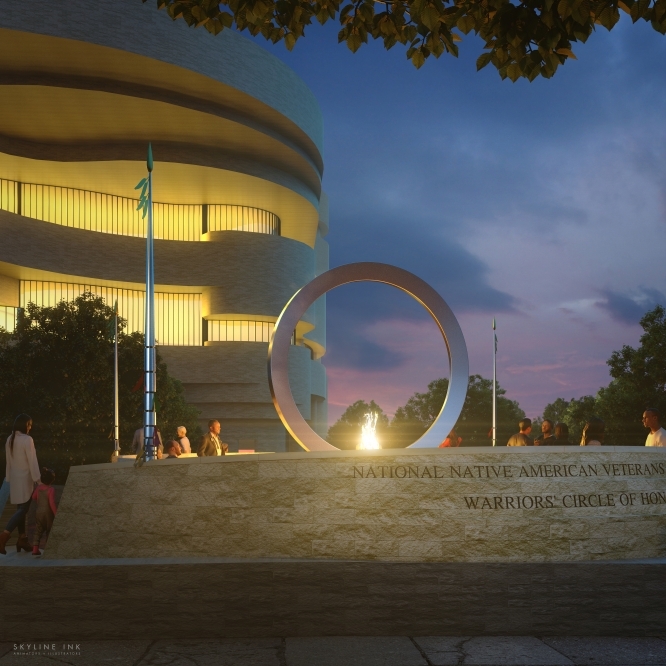 The jury for the Smithsonian’s National Museum of the American Indian National Native American Veterans Memorial has unanimously selected the design concept submitted by Harvey Pratt (Cheyenne/Arapaho) titled “Warriors’ Circle of Honor.” Groundbreaking for the memorial is slated for Sept. 21, 2019. It is slated to open late 2020. Pratt is a multimedia artist and recently retired forensic artist, as well as a Marine Corps Vietnam veteran. His design concept is a multi-sensory memorial. An elevated stainless steel circle rests on an intricately carved stone drum. Listen to Pratt describe his design concept in detail. The selected design will undergo further development in partnership with the museum. The National Museum of the American Indian conducted an international competition to select design concepts for the National Native American Veterans Memorial. Don Stastny, an architect and urban designer, oversaw the competition. The design was selected through a juried, two-stage process. For more information about the memorial, go to the National Museum of the American Indian’s website.